Just keeping it real over here on all accounts. Second, I’m fully aware that it is a bit dramatic to create and share a playlist titled “Post Break Up,” but hey, unfortunately most of us need a playlist like this at point or another. You are welcome. I’ve been adding songs to this list over the past couple of weeks and it was MUCH harder to keep it under a reasonable number than I thought it would be, which was silly to think because all artists have at least a handful of break up songs to their name. And really, I could have just made the list with only country songs… or only Taylor Swift songs. So is this list a bit cheesy? Yes, because there was no way I was leaving Dolly out of it. And it is definitely full of angst (my teenage self would be so proud). But it is pretty well-rounded — meaning it covers every stage of a break up and quite a few different situations. So please note, I obviously don’t personally relate to every single song, quite a few are just songs that I enjoy and love to jam out to regardless of what they are about. Enjoy! I love music. My taste is very diverse — continually being shaped by an unique combination of people, places and experiences. I never try to pawn myself off as someone who “knows music,” because I have too much respect for those who do. I did dance and took piano lessons growing up, but trust me, you do NOT want to hear me sing. But music is a topic that I never tire of and I love swapping recommendations. Please join in and share your own picks! View past posts HERE. I’m always a sucker for a good anthem song and people, I am obsessed with this song. Then again, I’ve felt that way by every single The Band Perry has put out. I saw them few years ago at Country Stampede in Kansas and I was really impressed by their range of influences and covers they chose to feature alongside their own songs. Considering Dierks has a great bluegrass album I’m not surprised he flip a song like this and add his own spin. A solid mix of mostly songs from the past 5 years or so. This song is 11 years old. Just let that sink in for a few moments. I knew from this very first single I was going to be a Miranda fan. At that time I don’t think there were that many new, young strong voices in country music. Don’t get me wrong I LOVED Faith, Martina and Shania, but Miranda had an unique sound and outlaw country attitude. Fast forward to now and I’d say she’s pretty much stayed true to that. I really didn’t like this song at first. Which was a bit disappointing because I hear she was good in Pitch Perfect 2 (which I haven’t gotten around to watching yet) and I still am bitter about her not getting the Oscar at 13 for her role in the remake of the movie True Grit alongside Jeff Bridges and Matt Damon. ANYWAY. I still wouldn’t say that I particularly like it that much, but dang it, it is really catchy and at some point I found myself not skipping it anymore. Last Sunday night I watched the 2016 Miss America pageant where Miss Alabama danced for her talent to this song and I freaked out a little. During my freshman year of high school on the dance team, we did a Matrix theme for our state competition performance and this was our opening song. I loved that routine, but our makeup and costumes were pretty intense and any picture proof I have is conveniently not on Facebook or my computer. Umm, let’s be honest. Anything by Fall Out Boy is great to work out to. This song is over a year old now, but it came back up on my playlists today, and is probably one of my FAVORITE collaborations! I was totally on the bandwagon for this song for much longer than I would like to admit, but a few weeks ago I made an effort to go back through and take it off of all of my playlists. Nope. I gave it try, and once was enough. I’ve been wanting to feature this song for the last two weeks but this girl is so new that hardly any of her music is on YouTube. Except, she’s not new. Apparently she’s been doing the red dirt scene for a few years now and was first noticed for her songwriting (Piece by Piece – Kelly Clarkson and Last Turn Home – Tim McGraw). But I really like this song so the link above takes you to Spotify. The song has a really “cool” vibe and I’d venture to say that this girl’s sound is similar to Kasey Musgraves, so I’m hoping that we start to hear more from her soon. So, what have you been listening to this week? Linking up with these blogs today! Here, Here, Here and HERE. 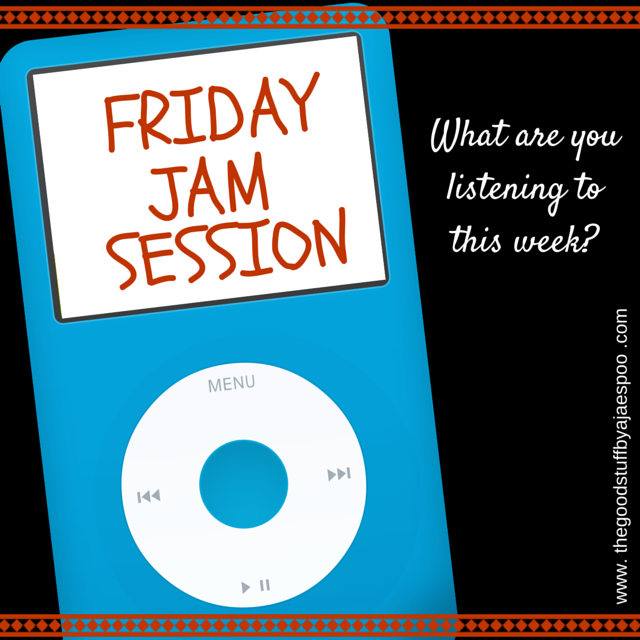 So I had lots of great ideas for this week’s Friday Jam Session theme. I listened to a lot of different music, and seeing as I just started this bit last week, the possibilities are endless. But ultimately my ears were driven by one thing: Miranda Lambert FINALLY put out a video for her “Mama’s Broken Heart” single. Long story short….I LOVE this song. Maybe a little too much. I know that my iTunes is probably extremely weighted in male vocalists but I will be the first to admit when I am really impressed by a fellow female. I think when it comes down to it, we tend to hold female artists up to more scrutiny. Unlike with men, it not just about talents and attractiveness (let’s be honest here.) We also throw up behavior, personal relationships and lives, style decisions and success up on the canvas to be judged. We expect them to be able to compete alongside the boys but keep a certain image and meet certain expectations at the same time. So, before I get everyone thinking that I’m becoming some sort of outspoken feminist, (trust me, I’m not,) here is this week’s Friday Jam Session, empowered by beautiful, strong voices, sassy personalities and women I think we can respect for owning their talent. ALSO…today just happens to be International Women’s Day! A coincidence? Maybe, if I believed in those. Not much left to say here, other than although the video wasn’t at all what I expected it to be, it definitely cracks me up. After dancing to this song during our state routine on high school dance team my junior year, it will always have a spot on my “Oldies Faves” playlist. No, Janis probably isn’t a great role model, but she’s classic and you know you want to sing along. Ironically my love for Paramore can be credited to a guy. I knew of them before, but it was my friend Kevin, his slight obsession and his coveted “chick mix” that got me hooked. Like Florence, lead singer Haley Williams is another red-head with a big personality, which of course only makes me like her more. This is my all-time favorite. So I’m cheating a little on this last one. The Henningsen’s are a father-son-daughter-family act (which I love,) lead by Clara, whom I’m pretty sure is the type of girl who could be an instant best friend. This is their debut video, which I have been anxiously waiting for alongside Miranda’s, and can’t get out of my head. Check out their other stuff online, I’m excited to see where they go.